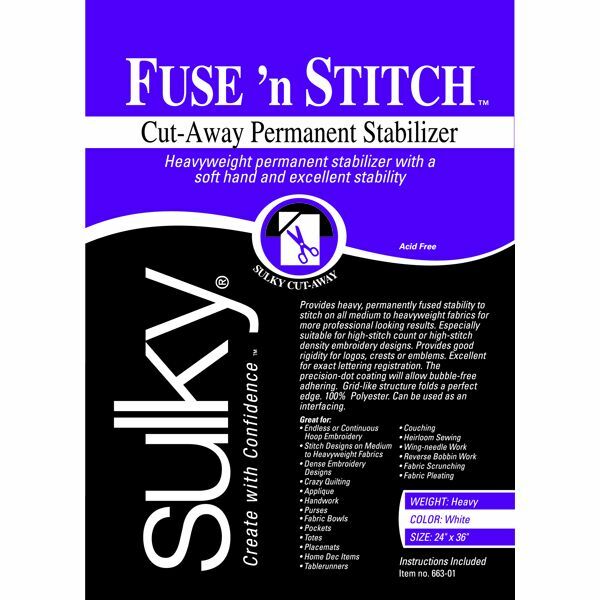 Fuse 'n Stitch Cut-Away Permanent Stabilizer - SULKY-Fuse 'n Stitch Cut Away Permanent Stabilizer. This is a cut-away, permanent and heavyweight stabilizer with a soft hand and excellent stability. It is great for endless or continuous hoop embroidery stitch designs on medium to heavyweight fabrics, applique, purses, pockets, totes, home decor, couching fabric, pleating and much more. 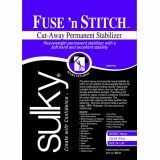 This stabilizer is especially suitable for high-stitch count or high-stitch density embroidery designs. It provides good rigidity for logos, crests and emblems as well as being excellent for exact lettering registration. The precision-dot coating will allow bubble-free adhering and the grid-like structure folds a perfect edge. This package contains one 24x36in piece of acid free, 100% polyester stabilizer. Imported.